WABAKININE (Wabacoming, Wabicanine, Waipykanine), Mississauga Ojibwa chief and warrior; d. August 1796 near York (Toronto). 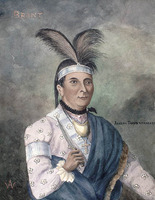 The most important event in Wabakinine’s life was his death, and the story of his violent end and its consequences helps dispel the traditional belief that relations between whites and Indians in Upper Canada were generally harmonious. Wabakinine signed several early land surrenders in present-day southern Ontario. On 9 May 1781 he was one of the Mississaugas (as the white settlers termed Ojibwas on the north shore of Lake Ontario) who confirmed the previous cession of a strip of land four miles wide along the west bank of the Niagara River. His name beads the list of ten Mississauga signatories to an agreement of 22 May 1784, which surrendered lands at the western end of Lake Ontario to the crown. It relinquished about one-half of the band’s hunting grounds, reserving only the “Mississauga Tract,” an area between Burlington Bay and the Credit River. Wabakinine was present at a conference of December 1792 that clarified the boundaries established by the 1784 agreement, and he signed a document of 24 Oct. 1795 conveying an additional 3, 500 acres to the crown. Hundreds of American immigrants began farming in the surrendered territory and made the Mississaugas’ lives a nightmare: farmers threatened to shoot the Indians for “trespassing”; vandals desecrated their graves; epidemics against which the band had no immunity reduced its population from over 500 to roughly 350 between 1787 and 1798. Late in August 1796 Wabakinine, his wife, sister, and others went to York from the Credit River to sell some salmon. With the money they had earned, they bought liquor and began drinking. Taking advantage of the situation, a soldier named Charles McCuen approached the chief s sister. To “induce her to grant him certain favours” he offered her some rum and a dollar, and that evening, 20 August, went to the Indians’ encampment. Wabakinine’s wife saw him, wakened her husband, and told him the whites were going to kill his sister. The chief, half-asleep and half-drunk, stumbled towards the soldier. In the scuffle that followed, McCuen hit him soundly on the head with a rock, knocking him senseless to the ground. He later died from the blow. Several weeks after, his wife died as well, When word reached some Mississaugas hunting around the upper Thames River that she had died of ill treatment by the whites, they called for revenge. Her brother, “said to be a considerable Chief,” gathered the band and stopped Augustus Jones*, a provincial surveyor, from proceeding with his survey of the Grand River region. No Franco-Spanish attack occurred, and the uprising never came. 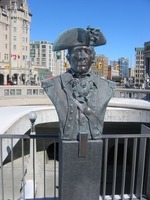 Peter Russell*, the administrator of Upper Canada, recognized the agreements Brant had made to sell lands to various whites. The possibility of the 400 Iroquois warriors joining the several hundred Ojibwas who would have been involved was thus removed. Too weak to act on their own, the Ojibwas abandoned the idea of avenging Wabakinine’s death. Ont., Ministry of Natural Resources, Survey Records Office, surveyors letters, 28, pp.137–39, Augustus Jones to D. W. Smith, 11 March 1797. PAC, RG 10, A6, 1834, p.197. PAO, RG 22, 7, affidavits and depositions, Home District, 1796–1835. PRO, CO 42/340, f.51. Canada, Indian treaties and surrenders . . . [1680–1906] (3v., Ottawa, 1891–1912; repr. Toronto, 1971), I, 5–9; III, 196–97. Correspondence of Lieut. 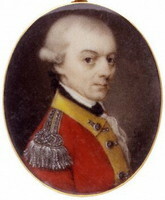 Governor Simcoe (Cruikshank), III, 24. The correspondence of the Honourable Peter Russell, with allied documents relating to his administration of the government of Upper Canada . . . , ed. E. A. Cruikshank and A. F. Hunter (3v., Toronto, 1932–36), I, 49–50, 117; 11, 30, 41, 306. Upper Canada Gazette; or, American Oracle (West-Niagara [Niagara-on-the-Lake, Ont. ]), 30 Dec. 1797, 12 May 1798. Handbook of Indians of Canada (Hodge), 5, 7, 9. [Kahkewaquonaby], Life and journals of Kah-ke-wa-quo-na-by (Rev. Peter Jones), Wesleyan missionary (Toronto, 1860). Donald B. Smith, “WABAKININE,” in Dictionary of Canadian Biography, vol. 4, University of Toronto/Université Laval, 2003–, accessed April 22, 2019, http://www.biographi.ca/en/bio/wabakinine_4E.html.